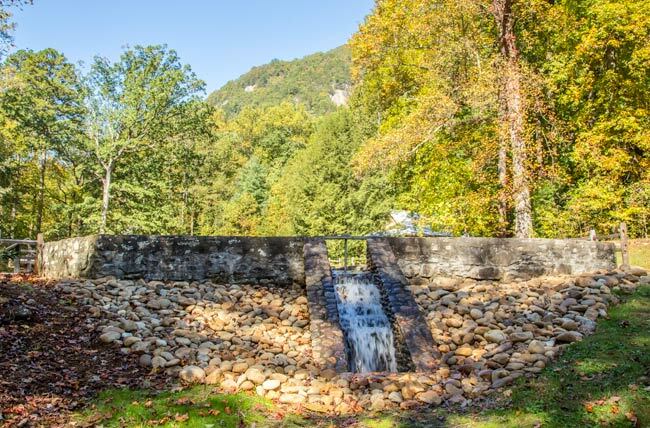 This newly-restored fish pond within the Cleveland Hatchery in Jones Gap State Park was built in 1931 by the South Carolina Department of Natural Resources. The Cleveland Fish Hatchery was South Carolina’s first state-owned and operated hatchery and was soon followed by other state-owned local hatcheries, the Table Rock State Hatchery and the Walhalla National Fish Hatchery. The hatcheries were developed as part of a long-term fish management plan to recover the diminished trout population following the destruction of stream habitats due to logging and the creation of public access to the South Carolina Foothills. The Cleveland Hatchery operated for around 30 years before closing in 1963. In recent years, part of the historic hatchery has been restored. The pond seen above currently stocks between 60 and 80 fish, consisting of brook, rainbow, and mountain trout. Below is the spillway for the fish pond, which flows into the Middle Saluda River. Today the fish pond is solely used as an educational exhibit. Signage encircling the pond gives visitors detailed information on each type of stocked fish. The hatchery is but one of the interesting features of Jones Gap State Park, which also includes the aforementioned Middle Saluda River – South Carolina’s first designated State Scenic River – a visitors center, and several hiking trails. We are not the official website so are unfortunately unsure of the dates. More information can be found on their official website, including a phone number. Here is the website: https://southcarolinaparks.com/jones-gap. What date is your fish?